As I’ve spent a lot of time looking at books in this vien over the last few years, this one is unique in its approach to church growth. Instead of programs and strategic planning type stuff, Growing the Church in the Power of the Holy Spirit focuses on how to develop a godly leadership team that learns how to discern and cooperate with the Holy Spirit. Programs and planning might be the RESULT of cooperating with the Holy Spirit, but that’s beyond the scope of the book. The focus is more on the spiritual development of the leadership to gain the skill of discerning what God might be calling the church to. Yet something was still missing. Nobody addressed the practicalities of “how.” We were urged and encouraged but not equipped or enabled. Hidden beneath the words lay the unspoken assumption that we all knew how to discern and then cooperate with the Spirit’s guidance. Looking at the story of Lazarus, the writers map out an image of the dance of cooperation. 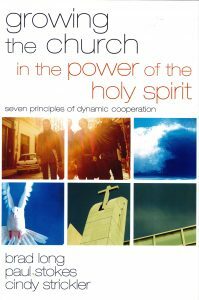 As they look at that story, they unfold the 7 basic dynamics to cooperating with the Holy Spirit and what that might look like in terms of growing your church. The authors fully believe that the Holy Spirit speaks and gives gifts at the right moment, and the book is full of illustrations of cooperating with the Holy Spirit and expressing those gifts. We would be mistaken to regard the dance of cooperation as just one giant leap of faith. Sometimes this may be the case, but often it is one small step, followed by another and another, that enables us to walk by faith. The authors draw from years of personal teaching experience around the world and practical experience in churches to build a beautiful image of cooperating with the Holy Spirit. The principles the outline have been field tested around the world, and several stories from different cultures back it up. This is not a book of large church vs. small church, country vs. city, or any other type. Rather, this book is focused on helping you discover how to cooperate with the Holy Spirit. The three authors are friends of mine. I’ve known them for nearly 15 years. But even with that kind of first hand friendship with the authors, I’m still very impressed with this book.